Home > Politics > Gender > Women Life Freedom! Women have always played a part in revolutionary change, and progressive forces have championed the equal role of women, even if the practice hasn’t always lived up to the ideal. But nowhere has it been more true to say that a woman’s place is in the revolution than in the Kurdish regions of Turkey and Syria, where the Kurds and their neighbours are attempting to construct grass-roots community-based democracies that provide a source of hope and inspiration for everyone who looks towards a better future. The Kurds’ revolutionary ideology has been elaborated by the PKK leader, Abdullah Öcalan, from his prison cell in Turkey. Öcalan’s prison writings owe a major debt to the ideas of the American theorist, Murray Bookchin, but whereas for Bookchin the obstacle to progress towards a better society was hierarchy, Öcalan narrows this down to patriarchy and puts forward an alternative science of women, or ‘Jineology’. As a political theory, this is problematic – not least in its tendency to essentialise and idealise women’s roles and nature – but the actual women’s movements that these ideas have come out of and that they feed back into are truly inspirational. They provide concrete examples of revolutionary social change that have lessons for women and men everywhere. Traditional Kurdish society is strongly patriarchal, but the Kurdish movement for women’s equality has long and strong roots. Across the ‘Arab Spring’ women were active participants in the struggle, but in most places they were quickly put back in their box, often ending up in a worse situation than before. Kurdish women are determined that this will not happen to them. And they are resolute that women’s equality is central to revolutionary practice – not something to be postponed until later. The PKK in Turkey led the way in women’s involvement, and when the Syrian state cracked down on Kurdish political activity in 2004, it was the women’s networks that were able to keep the resistance active. When, in the power vacuum of the Syrian civil war, the Kurdish majority areas of northern Syria were able to establish autonomous control, the secular grass-roots democracy that they established had feminism at its core. In the fight against Daesh (ISIS) in northern Syria, and now against the invading Turkish army, Kurdish women have played a huge part. Female soldiers of the Women’s Protection Units (YPJ) have demonstrated their commitment to the defence of their people’s land and freedom – and YPJ commander Rojda Felat took a lead role in the recapture of Raqqa from the Daesh fighters who had made it their capital. Western photojournalists love to concentrate on women with guns, but besides taking a full share in defence, Kurdish women are at the forefront of an on-going process of revolutionary social change. They are helping to bring in new laws, and also to change ideas and habits from the bottom up. The society they are creating requires every organisation at all levels to have male and female co-chairs, and for at least 40% of its posts to be taken by women. In the Kurdish areas of Turkey, where Kurdish politicians have been arrested and imprisoned, many prominent women are now behind bars. Last Women’s Day, seven HDP women MPs sent out messages of resistance from prison. Gultan Kisanak, the co-mayor of Dyarbakir, who has been in prison since October 2016, was first arrested as a student Kurdish activist in 1980. She has been arrested many times, and tortured too. Of course not all women’s life histories are heroic on this scale, but, for many others, active involvement in the new society is itself a revolutionary act that requires them to take a stand against centuries of tradition, and often against their own family members. The grassroots community-based democracies that are being built up in the lands liberated by the Syrian Democratic Forces, and that the Kurds have also tried to establish in Eastern Turkey, expect and encourage women’s active involvement. Women take their part in all the committees and organisations running the new society, and also in the many separate women’s committees, including committees and courts that look into issues of domestic violence. Alongside these organisational structures they are developing opportunities to increase their education and become economically independent. Their community-based society encourages the establishment of co-operatives, and many co-operatives are run by women. All these ideas have long been part of Kurdish hopes and plans, but for their secular, multi-ethnic society to succeed, then others with whom they live have to be brought on board. Quotas are used to make sure that other ethnicities are represented in the different organisations, and these have to be backed up by personal contact, persuading members of these different groups to take part. Women have to reach out to their sisters across the patriarchal barriers. This has become especially important as more areas become part of this federation of autonomous democracies – places such as Manbij, where Kurds are in a minority and where the establishment of a multi-ethnic democracy is seen as a model that could provide an example for the whole of Syria. Writing from the comfort of Scotland I can only be in awe of what these woman are achieving. I am also intensely aware of the dangers facing them and their revolution, as the Turkish state becomes increasingly authoritarian and fascistic, and global powers compete for influence and control in Syria. These powers have no interest in allowing a grassroots democracy to succeed. They are untouched by appeals to preserve a Kurdish cultural existence, and, though some may express support for women’s equality, they won’t allow this to get in the way of their strategic interests. 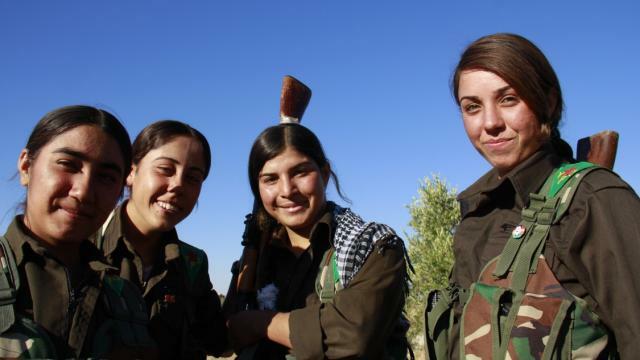 Support for the Kurds’ democratic feminist revolution will only come from ordinary women and men who not only empathise with their situation, but also recognise the importance of their achievements for us all. International Women’s Day has become an important date in the Kurdish calendar of protest and resistance, and the central place given to the feminist struggle is emphasised in the Kurdish slogan Jin, Jiyan, Azadi – meaning Women Life Freedom. What better slogan for this Women’s Day? Yes, the question of how these ideas (of female equality, competence and character) might extend their influence across Kurdish culture into those of other local groups will perhaps as much as any other help define the societies that follow. When I was reading The Unwomanly Face of War by Svetlana Alexievich, I was struck by the experiences of the female partisans who took on terrible burdens with most able-bodied men at the front, faced with the terror of occupation and the threat to dependants (children, old folk), making awful and stressful decisions under the possibility of denouncement, torture, mass reprisals and all the rest. After the USSR’s experience of the Great Patriotic War, as they called it, after doing their great patriotic duty, women’s status seems to have diminished again, their stories largely written out of the major historical narratives with the exception of a few well-known tales or stereotypes. The female combatants, like the tank medics who faced incredible danger, and non-combatants, like the nurses who saw so much death within arm’s reach, proved themselves collectively, though they retained their individual and often feminised experiences. Alexievich tells that her women often recounted their experience of the war through rich and detailed sensory reports (one could no longer stand the colour red), and they expressed more concern for the environmental damage, the earth, birds and trees. I am not sure how much this is influenced by cultural norms. It may usually take time and struggle to fulfil the logic of revolutionary ideas, and there seems to be times when reactionary forces, as the article mentions, force group progress backwards. One of my grandmothers used to joke about how her husband liked the limelight, while she by implication was left in comparative darkness. I hope the Kurdish women’s movement can make best of its time in the light, and create inspiring stories for others to appreciate.